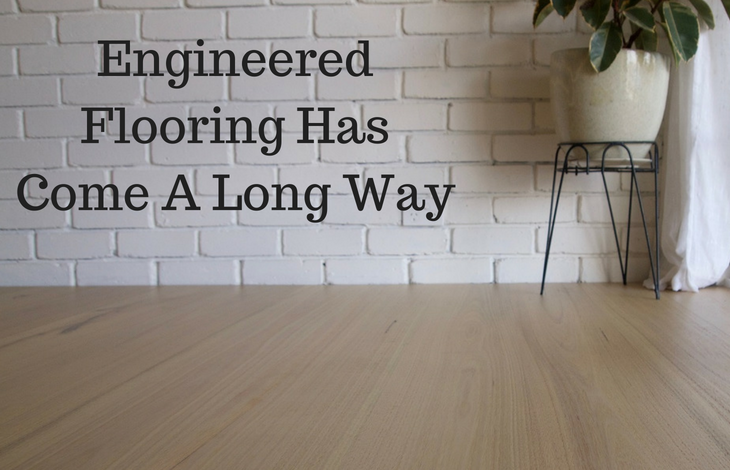 As far as flooring materials go, engineered hardwood floors have become a more common option in Australia, with more people choosing it over marble, slate and even traditional hardwood. This can be tied to different reasons including reliability, price, finish, and maintenance, among others. To understand why this type of flooring is quickly becoming the way to go, you need to learn what it is and ow it has changed over time. The first question people ask when they meet the term engineered flooring for the first time, is what it means. What is it made of? How different is it from other types of floors? These are some of the other questions that follow soon after. It is a type of flooring material made from different layers of components. Most of them are made using materials such as plywood and unfinished whitewood, and then finished off with a hardwood veneer, made from such wood as high quality oak. The materials are laid out in different directions, in order to give it strength and durability. The hardwood finish is then prefinished with a tough coating made from urethane-like material to enhance its durability. Depending on the quality and price range you are looking for, you can have floors from the lower end of the spectrum, having between 3 and 5 layers. Higher quality engineered hardwoods cost more, and can have as many as 12 to 15 layers. The main difference is that the cheaper ones tend to have thinner veneers that cannot be refinished when they start showing signs of wear. The more expensive ones have thicker floorboards that are more resistant, can heavier weights such as wardrobes with ease, and more importantly, can be refinished several times over when they start showing signs of wear. 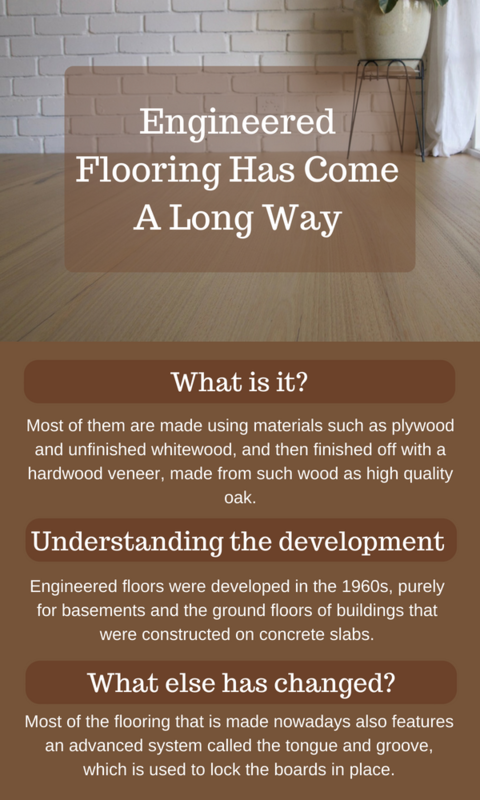 Engineered floors were developed in the 1960s, purely for basements and the ground floors of buildings that were constructed on concrete slabs. This was because it was harder to install traditional solid hardwood floors in these areas, which prompted manufactures to come up with something that looked similar, but could withstand the harsh conditions better. In the beginning, this type of flooring was rarely used for any other purpose. This meant that the variations available were limited, and the thickness was also standard across the board, in order to suit this single function. The type of wood used in the finishing was also restricted to 2 or 3 common hardwoods only. Over time however, the usage of engineered hardwood flooring has become more diverse, with its popularity over solid hardwood floors and timber floorboards rising exponentially. Their use is no longer restricted to basements; they are now installed in places where you would traditionally expect a different type of flooring, in the kitchen for instance. They have also vastly improved in terms of quality and finishing. Where they used 2 or 3 types of hardwood, you can now find a wider variety of finishes, including birch, ash, cherry, mahogany, and a personal favourite for most people, oak. Another aspect that has changed in the manufacture is the thickness. Where they traditionally came in a standard thickness with a set number of layers, this has changed to as many as 15 layers being available. This has of course positively affected the quality of the flooring, making it last longer and withstand more stress. Another major change that has been made with regards to this type of flooring is the ease of installation. Engineered floors that are thinner than 3 quarters of an inch can be glued down just like any vinyl flooring. This not only makes then pretty easy to put up but also opens you up to a world of possible DIY projects, which could save you some money. Using glue also does away with the danger of puncturing household infrastructure such as wiring and plumbing with nails. This feature, coupled with the fact that they transfer heat more efficiently in comparison to normal solid wood floors, makes them ideal for installation over radiant heating units. Most of the flooring that is made nowadays also features an advanced system called the tongue and groove, which is used to lock the boards in place. This type of design has made it a lot easier to install, slashing the time needed by as much as 46% in comparison to older boards. These types of floors are also a dream for any renovator, since they make it easy to transition between rooms. For example, you can use flooring with different thicknesses to create a smooth even feel when moving from a wooden floor in the living room, to a different material in the kitchen, such as tiles for example. This removes the need for large transition strips and the bother of trimming doors that is sometimes required.